The user friendly Rizk Casino gets you in the mood for some online gambling. The more time you spend online, the less likely it is to look elsewhere for a long term partner. Rizk Casino covers all bases and keeps you happy with an eclectic mix of promotions. Any serious Rizk Casino review begins by highlighting the fact that this gambling operator is the proud owner of three licenses. Authorities from Malta and Curaçao, as well as the UK gambling commission gave their seal of approval. This is the result of the casino maintaining an impressive track record, paying all their customers on time and in full. With so many licenses, the downside is that residents of several European countries are denied access. In addition to players from United States, Hong Kong, South Africa and Nigeria, those who live in Belgium, Denmark, France, Hong Kong, Ireland and Italy are not allowed to play. All those who are located in a country where online gambling is legal and don’t feature on this list are eligible for joining promotions. Rizk Casino has a handful of trusted agencies performing independent audits on a weekly basis. These verifications are overlapping, so the odds of games evading scrutiny are slim to none. Add to this the fact that the software developers check the algorithms themselves before releasing new games and you are entitled to feel safe when gambling here. In addition to taking a glance at the seal of approval, visibly displayed on the website, players can also see the payout tables for all games. Outside threats are also mitigated by the combined use of SSL encryption and firewalls. This technology serves the purpose of preventing unauthorized people from reading sensitive data, such as financial information and passwords. So far, there were no instances in which money was stolen and there are no Rizk Casino reviews complaining about identity theft. Microgaming, NetEnt, Play'n GO, NextGen Gaming, Quickspin and Thunderkick provide the high-quality slots. Players can browse by vendor, or by genre and even play different Rizk Casino games simultaneously in browser. South Park: Reel Chaos, GLOW, and Mega Fortune are the most popular NetEnt slots, on par with Microgaming flagship games. Break da Bank Again, Girls with Guns Jungle Heat and Immortal Romance are some of the classic pokies that can be played on Quickfire network. The offer for table games aficionados is diverse and includes Poker 3 Heads Up Hold’em, Red Dog and Oasis Poker. However, most fans prefer to play Rizk Casino table games such as blackjack, roulette and baccarat. These have the upside of being playable against real dealers and have different versions such as single deck blackjack Pro, Perfect Pairs, French, European and American roulette. Punters won’t be able to bet on sports, but at least they can gamble on virtual sports games. The mobile division of rizk.com has a more limited game selection, but features all classic slots and table games. Most video pokers can be played here and the payout tables are identical regardless of the device used. Rizk Online Casino stays true to its motto and the bonuses it offers are easy to redeem and have no strings attached. This is one of the few places where the first deposit is matched by 200%, so you can commit as little as €50 and play with €150. The maximum Rizk Casino welcome bonus won’t exceed €100 and the amount needs to be played through 45 times. The casino has a unique sliding bonus scale, which makes it easy to clear 100% bonuses, which only need to be played through 35 times. Poland, Bulgaria, Greece, Hungary, Romania, Croatia, Ukraine, India, Pakistan, Indonesia, Russia, Czech Republic, Portugal, Slovakia, Latvia or Thailand residents are not eligible for the Rizk Casino no deposit bonus. The ongoing offers are available to all real money customers and different games have different stake percentage contribution. Slots and games in the “other” section count for 100%, while classic slots have a conversion rate of 75%. Rizk Casino promotions clearly benefit fans of video slots, as opposed to those who play table and live casino games. The latter will need to play 10 times more, because these games count for 10% while video pokers don’t make any difference. Players can attempt a withdrawal before meeting the wagering requirements, yet this will result in the forfeit of the bonus and resulting profits. 30 days after bonuses are awarded, they expire unless the play through demands have been met meanwhile. The Wheel of Rizk is one of the exotic features that can only be enjoyed at this online casino. Each player has a personal 'Rizk Power Bar' and this can be filled out by playing slot machines and other casino games on real cash. Once full, it triggers free spins that can be used exclusively on the Wheel of Rizk, to win bonus spins, cash rewards and raffle tickets. There are even super money jackpots to be won here and the adventure only ends when the wheel stops at a skull symbol. 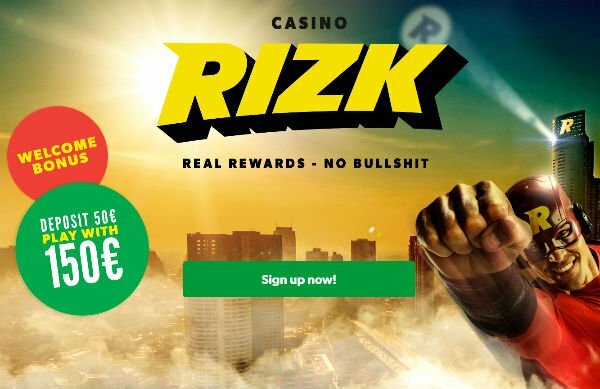 The bonuses and promotions of Rizk Casino may change. Rizk Casino payment options focus on popular financial instruments, rather than cover a broader spectrum. Neteller, Skrill or Paysafecard are preferred to both Visa and MasterCard, because there are no commissions or hidden fees charged. Unfortunately for credit card users, these are subject to a 2.5% fee for deposits and withdrawals, which eat into the profit margin. Minimum deposits start at €10 and players can invest as much as €5000 per transaction and just as much money can be cashed out. The casino takes great pride in stating that when players cash out via electronic wallets, transactions are performed instantly. What actually happens is that members have to wait up to two hours to receive the cash, which is still vastly superior to what most casinos offer. It is not possible to withdraw less than €20, regardless of what financial instrument you rely upon. Customer support at Rizk Casino is provided via phone, live chat and email. Instant messaging is only available to registered users, so those who need more information should at least sign up for an account. On the other hand, writing an email will help players clear any doubts and get valuable info. Fully fledged members tend to use live chat more than phone support, mostly due to the lack of a toll-free number. Regardless of the channel of communication, Rizk Casino strives to offer the kind of customer care that leaves nothing to be desired. Due to these high standards, many choose to skip the FAQ page altogether and interact directly with a specialist. While these experts are available 24/7, it is definitely worth taking a quick glance at the questions answered by fellow users and casino officials. This brand hits all the checkboxes, with its generous promotions, well-paying games and mobile friendly interface. The design is top-notch and even beginners have an easy time navigating the website and finding a game out of hundreds. The innovative Wheel of Rizk feature and the sliding bonuses can help players offset the negative effects of variance and survive during downswings. This Rizk Casino review should convince you that gambling here is secure, given the auditing companies and encryption protocols use. What prevents this gambling operator from reaching its full potential is the fact that credit cards are charged deposit and withdrawal fees. This can have a deterring effect on savvy punters, who don’t like the idea of being charged twice, after finally beating the house edge. Not just for Scandinavian players, played at Rizk? let us know what you think. - Rizk Casino has better than average promotions, sliding bonuses and a good variety of network progressive slots. - Original features such as the Wheel of Rizk keep players at the edge of their seats and trigger additional bonuses. - Fully fledged live casino section. - Those who live in some European countries and the US can’t sign up for an account and residents of other countries are not eligible for bonuses. - Rizk Casino charges players who deposit and cash out using credit cards.